Are you working hard for someone else? Do you have a great idea? Are you sitting at your desk at your company office, reading this and thinking yea I do want to start a business? Are you ready to take the leap? Or have you already jumped!? I recently did a podcast with executive business coach and radio show host, Amy Walker. We talked about the entrepreneurial spark, and what it takes to run a business. The good, the bad and the ugly. It caused me to reflect on how I got to where I am today in my business, and all the bumps along the way. The first business I started was sort of an accident. I was training teachers at the graduate level, and they needed resources. I found a need and started to fill it, not thinking of it as a business. I started collecting resources and sharing them in the form of an extensive newsletter. It took me hours. Then people kept asking me where they could buy the resources. So I went to a local bookstore to see if they could provide them. I was procuring the resources and delivering them but not making any money for my effort. Someone said to me, why don’t you get a resale license and sell them yourself, and a business was born. I call that ‘accidental entrepreneurship’ as I had no intention of going into business. Once it took off, I saw clearly that it could be a business and wrote a business plan, got it funded and opened the doors. That process was difficult, but not nearly as hard as having to close my business three years later. You’ll hear the whole story in the recording, but let’s just say I was losing a lot of money fast. The next business I started was accidental as well. You’d think I would have been better prepared for business number 2, but I wasn’t. It was a result of not knowing what else to do. Being entrepreneurial, I have little fear. I just took a leap, no plan, nothin’. 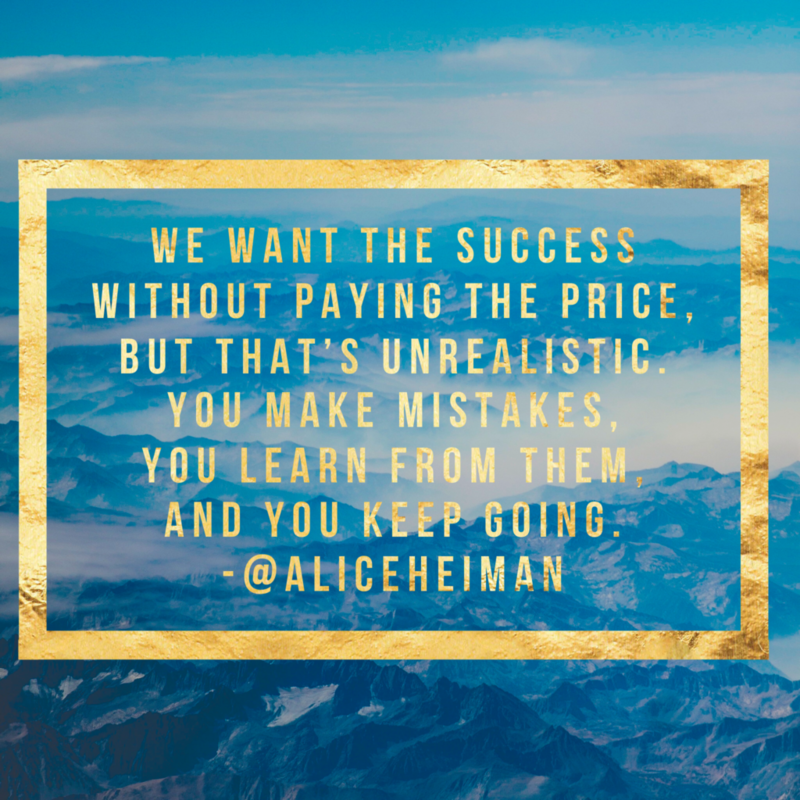 Company number 2 is my current business, Alice Heiman, LLC that I started in 1997. My current business has evolved several different times. It has had its ups and downs, as you will hear, but I love it! I’ve learned a ton, and it is currently going through its next exciting evolution. Starting a business can be exhilarating and exhausting, but if you’re ready to make that leap, or you’ve already made it, here’s some things that will help you. As I say in the interview, I highly recommend you make a plan, your chances of success will be much higher. First, you have to establish yourself as an expert and build your tribe. It’s crucial for small business owners, whether they are selling a product or offering a service. I recommend doing this before you leap, but most of us don’t. Start taking action to build your personal brand, your expertise and your tribe. This will give you a strong foundation, so when you are ready to sell, your tribe will already know who you are and look at you as an expert. People are willing to listen more and look at your product and services when they know you, like you and trust you. As the owner of your business, even if you have a sales team, you need to be the CLG – Chief Lead Generator. You should draw people to you because of your expertise and then you can give those leads to your sales team. When you are just getting started it’s hard to get those first few sales. It’s hard to get a client when you don’t have any clients. “Hey, Mr. Customer, I have a great product and you should buy it. You’ve never heard of me and no one has ever purchased our product, but you should. It really works, trust me.” Sounds ridiculous, doesn’t it? You need social proof and some references to get you started. Both times I started a business, I was already doing the thing I wanted to sell. I had a tribe. They knew me, liked me and trusted me. I had already proven my expertise so they were willing to pay for it. If you don’t start your business that way, you can still get social proof and references; however, you may not be able to charge the full amount, but you can still get some accounts started. You could offer it to a non-profit or another small business that could use your product or expertise. Offer your services to them for free or at a discounted price, but only if they agree to give you feedback, let you write a case study, and/or allow you to use them as a reference. This will let you test and prove your concepts. If you do a great job and go above and beyond, you will have great referral sources and testimonials for your website. Pro-Tip: Write case studies about your first successes and publish those, but don’t stop there. Great stories sell. Continue to write case studies that share your customers’ successes. Even though those first customers might not have paid you with cash, they’ve paid you with the case studies and their testimonials. You’ve also proven yourself and built your reputation. Happy customers may even become a ‘walking advertisement’ for you. You see those other companies and think, wow, how did they do that? You’ve heard people say, “She is an overnight success.” Sorry, there is no such thing. Oh, I’m an overnight success all right, and it took me twenty years to get there. Whether you’re an entertainer, a business person, inventor, or an artist there’s always a backstory to your success. We have to work hard and smart and go where the opportunities are. Some just seem to get lucky, but we all know that most luck comes from the previous things I mentioned. We have to prove ourselves. We have to work smarter. We really have to get the credentials that will allow people to look at us as an expert. Then they are willing to pay for what we offer. As the saying goes, when the going gets tough, the tough get going. The way I get going is to get help. I can’t possibly know everything and I don’t want to slow down my own success, so I find people who know the things I don’t and pay them to help me get there faster. In the interview, you’ll hear me talk about the many business coaches I have used over the years. In fact, I’d like to take a moment here to thank a few. Nancy Anderson, Valerie Cardenas, Leisa Peterson, Joelle Jay, Deborah Dupree, Laurie Taylor, and I am sure there are more that I am not remembering right now. Get the help you need. It costs money, but it is worth it. Overnight successes aren’t a thing, but success is. Amy asked me, “What is your definition of success?” This is an important question to ask yourself. What is success for you? It’s important to define your own success and not look at others. Everyone is different, and money is not the only defining factor in success. For example, I feel highly successful, widely successful. Am I as rich as Richard Branson? No, and I may never be because it is not a goal of mine. The risk of failure is part of being an entrepreneur. It’s critical for entrepreneurs to be able to hear the reality that not every single thing that we undertake is going to be an instantaneous success, but it does not mean that we are a failure and that we can’t continue to move forward. The destination is the same, you still have that same desire to own a successful business, to make an impact and make a difference. That part doesn’t change, just sometimes the business that we’re doing does need to change. Not every business is a win, and that’s okay. Any great entrepreneur will tell you about their failures, and I think that’s the part we forget. We see people and we go, “Wow, look at that, they have all that.” Really what you don’t know is the backstory, and what it took for them to get there.” We want the success without paying the price, but that’s unrealistic. You make mistakes, you learn from them, and you keep going. If the entrepreneurial spirit moves you and you start your own business, or if you are in the weeds of working night and day to make your business work, you are in good company. That entrepreneurial enthusiasm will get you started and keep you going. Your hard work and tenacity will bring you success, and your failures along the way will help you learn and make you stronger for your next adventure. I hope you enjoyed the interview. I’d love to hear your entrepreneurial story or questions. Please post a comment. Great post Alice and a great interview with Amy. Keep up the great work. Thanks, Barry! You are a great supporter. Alice, thank you for our your thoughts down on paper. I needed to have some of the things I am doing reaffirmed and I also appreciate the encouragement, that failing, doesn’t make me a failure, as long as I learn from that failure. What is failure? It’s all perspective. Failure is a lesson learned. Failure is an open door to the next adventure. Failure is a necessary part of life. Failure is how we learn. Think of a baby learning to walk or a child learning to ride a bike. Somehow when we get older we think we should try something new and do it perfectly the first time. Happy to discuss with you any time.